Solomon’s Seal and Periwinkle — can I grow them in the same flower bed? I was given some of both, Periwinkle and Solomon Seal and I planted both in the front of my living room window. There is plenty of shade; I just need to know if I need to move one from the other. These are new plants for me so need some help. Just planted 4-9-2019; no photos to share at this time. 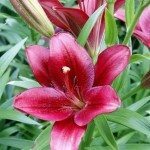 LiliesAre Oriental And Asiatic Lilies The Same? I can't find any reasons why you couldn't, but to be safe, you may want to make sure they have just a little room to spread. As long as they aren't planted within a few inches of each other, then it shouldn't cause too much of an issue.